Ali outside the Bahraini Embassy. “I am doing it to save my father’s life.” Ali Mushaima is on his seventh day of hunger strike. His father, Hassan Mushaima, is currently in Jau Prison, Bahrain. He is seven years into a life sentence for organising against the regime during the 2011 uprising. While in prison, Hassan has been beaten, tortured and degraded. His situation is made even worse by his complicated medical conditions. He suffers from high blood pressure, diabetes, gout, and a urinary tract infection, as well as being a former lymphoma cancer patient. Despite his medical history, Human rights Watch says that he has had medical care withheld. “I felt like I had no other choice” explains Ali. 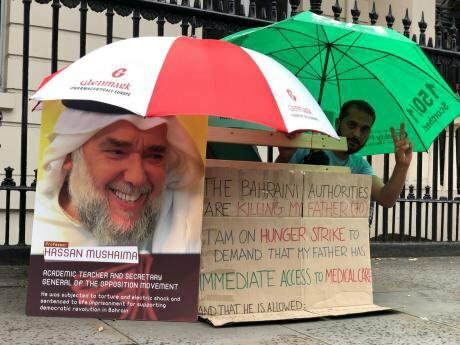 “My father is 70 years old and is being denied basic medical care.” Ali’s hunger strike began on August 1st outside the Bahraini Embassy in Knightsbridge, London, and he has not moved since: “I had to act. I didn’t want to wait until he got even worse.” He is demanding that all medical treatment and medicine is restored for his father, as well as full visitation rights and access to his books and personal possessions. His father, Hassan, was once an MP in Bahrain. He had been living in the UK since 2006 for medical reasons, but went back to Bahrain during the ‘Arab Spring’ uprising. He was arrested three weeks later as part of a widespread crackdown. The crackdown was severe, with over 500 political prisoners arrested in the aftermath of the 2011 protests. “He was fighting for freedom, democracy and dignity,” says Ali, who was charged in absentia as part of the same trial. One year later Ali had his Bahraini citizenship revoked. If he returns to Bahrain he will be arrested. The abuses against campaigners have continued. A recent Amnesty International report found that in the 12-month period preceding June 2017, at least 169 government critics or their relatives were arrested, tortured, threatened or banned from travel by the authorities. The report also accused the regime of torture, clamping down on free assembly and dismantling political opposition. Over the last six years, Whitehall and Downing Street have provided £5 million-worth of assistance to Bahrain in support of its ‘reform programme.’ In theory this was established to build effective institutions, strengthen the rule of law, and ensure police and justice reform. In reality it has provided a figleaf of legitimacy to a system that continues to punish opponents and quash dissent. One thing that has helped Ali is the support he has received from other campaigners and passers-by. There have been protests and vigils in support of his demands, with people coming from across London to support him. Please sign and share this petition in support of Ali’s demands.